We can’t wait to get things rolling in 2012. There’s already so much to get excited about. The 4th Totally Fabulous Vegan Bake-Off will be here in less than one month, closely followed by Vegan Rock, a fundraising concert and bake sale, so we hope you’ve got your sweet tooths polished! It may seem odd to be reporting on a delicious stop to Sadie’s Juice Bar and Ice Creem Parlour in January, but they’ve got some new items to keep you warm through winter, just like our recipe featuring garlic, a great immune booster if you’re prone to colds and flus. As usual, there is always some good news to report and we’re happy to see 2012 is off to a good start, with a local councillor in Markham pushing for a ban on shark fin and a law school in Oregon announcing a program specifically focused on animal law. The 4th Totally Fabulous Vegan Bake-Off is happening Saturday, February 4th from 2:00 to 4:30 pm at 918 Bathurst. Find out more in the TVA in Action section or on Facebook. TVA in Action – It’s not hard to make your new year a sweet one. Lined up is the 4th Totally Fabulous Vegan Bake-Off, soon followed by Vegan Rock, a fundraiser concert and bake sale. The new year also brings new directory updates that you don’t want to miss, including a food box delivery service coming to the Resource Centre! In the News – Markham is the next municipality on its way to banning the sale and consumption of shark fin thanks to Ward 1 Councillor Valerie Burke. A university in Portland has recognized that more and more people care about the rights and welfare of animals, launching a new animal law program! 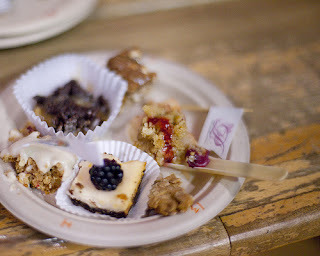 The 4th Totally Fabulous Vegan Bake-Off is just one month away, and registration is now open! Come out to sample and vote for your favourite decadent and compassionate sweets in five categories, or enter as a contestant and show off your mad baking (and maybe un-baking, for the raw foodies out there!) skill. Where? 918 Bathurst Street (north of Bloor). We regret that the venue is not accessible. How much? Admission is free but tickets will be sold for plates of sample treats to eat and vote on. Visit veg.ca/bakeoff for more details, and follow the bake-off on Facebook! Looking for a “hard to find” vegan ingredient? Panacea is Toronto’s only all vegan grocery store and is your source for those hard to find vegan items such as marshmallows, white chocolate chips, whipped cream, cream cheese, yogurt and more. This year’s Vegan Rock has a new lineup of compassionate local musicians, along with the usual tantalizing bake sale! Come out to hear some great music and get some great vegan goodies, all the while supporting a great cause: The Toronto Vegetarian Association! All proceeds support TVA, funding programs like the Veggie Challenge, community outreach and our drop in resource centre. Where? The Boat (158 Augusta Avenue in Kensington Market). We regret that the venue is not accessible. How much? $10 to get in, costs of baked goods at the bake sale will vary. Find out more and RSVP on Facebook. Find other veg-related event listings at veg.ca/events. The Dinner Social Group will hold their next meeting at Annapurna (1085 Bathurst Street, at Dupont) on Thursday, January 19th at 7 pm. Please RSVP by the Wednesday before the event to 416-544-9800 or tvadinner@veg.ca. TVA Reads will meet Monday, January 9th for a potluck dinner and to discuss Second Nature: The Inner Lives Of Animals by Jonathan Balcombe. Location to be announced. Please contact Shân at tvareads@veg.ca for more information. The Vegetarian Meetup Group is meeting for brunch at the Windsor Arms Hotel on Sunday, January 15th at 10:30 am. Click here for more information and to RSVP. Join one of TVA’s social groups. If you’re someone who’s vegetarian but still enjoys and misses the taste of meat, you’ll want to check out Phony Balony Vegetarian Delicatessan Catering. For now they cater small and medium size events, but they have a deli storefront opening soon! Click here to learn more and see their full menu online. Plus, we have an exciting announcement! Fresh City Farms delivers Toronto’s freshest and most local produce box all year round. A social enterprise, they empower people to start city farming businesses in yards and other spaces across Toronto. Even during the colder months their salad greens are usually harvested the morning of delivery from their greenhouse at Downsview Park. It doesn’t get any fresher than that and they don’t use any synthetic fertilizers or pesticides. And now, they’ve partnered with TVA to provide us with our own pick up location, plus a discount for Vegetarian Discount Card holders! Starting soon, they’ll have a convenient pickup location at the TVA Resource Centre, every Wednesday between 6:15 pm and 8:30 pm. You can customize your box, cancel at any time or skip weeks and we have a satisfaction guarantee. Please inquire with Ran for full details and sign up at www.freshcityfarms.com. Learn more about these and other updates in the Directory Updates. Ward 1 councillor Valerie Burke hopes to make Markham the next municipality in Ontario to ban the sale and consumption of shark fin, and you can help! Markham council has not been as supportive as other cities to get on board with neighbouring municipalities that have banned the cruel import and councillor Burke needs to show them there is public support. Click here for a link to a Facebook page you can “like” to show your support and for quick access to send an email to Markham councillors. Lewis & Clark, a university in Portland, Oregon, has recently announced it will become the first law school in the world to offer an advanced degree in animal law. For years, the school has been gaining a reputation as a national center for training attorneys to help society work out these issues and now students will be able to make it an official part of the training. Click here to read more! Although often criticized for its stanky breath and garlicky sweat inducing qualities, Allium Sativum, also known as garlic, is definitely worth the potential risk of losing friends. Here is why. It is a prebiotic. Firstly, what the heck is a “prebiotic”? Well, it is a non-digestible food that stimulates the growth of good bacteria (bifidobacteria and lactic acid bacteria) that exists in the small and large intestines. Simply stated, a prebiotic improves the host’s health by improving their metabolism. In turn, this increases the absorption of vitamins and minerals, and reduces the risk of colon cancer and potentially most illnesses. Raw garlic is an example of a prebiotic. It is an immune booster. When crushed or chewed, garlic releases a compound called allicin that has anti-bacterial, anti-viral, and anti-fungal properties, which is why it is often used to combat those nasty winter illnesses. What is even better than that, garlic helps in preventing said illnesses from occurring in the first place. It is also used to fight fungal infections like thrush, combat bacteria related digestive disorders and doubles as a disinfectant. It is good for your heart. Garlic reduces the presence of lipids in the blood, which if high, could potentially have detrimental effects on one’s heart health. The consumption of garlic can aid in reducing this risk of heart related illnesses by lowering LDL cholesterol and decreasing the risk of hypertension, insulin resistance and Atherosclerosis. These are more than a few reasons to whole-heartedly love garlic. It is a flavour enhancer. Instead of slathering on the oil or adding handfuls of salt, add some garlic to boost your food’s flavour. It’s inexpensive, better for your ticker and a little goes a long way. You can put it in almost everything. Bruschetta, homemade bread, salsa, stuffed olives, ANY soup, “cream” sauces, sauces in general, stuffing, marinades, (name a vegetable) gratin, nut loafs, or roasted on its own and eaten solo. Try to name a savoury dish that wouldn’t benefit from the addition of garlic. It’s pretty difficult. So, in conclusion, after screaming from the roof top about how fantastic it is for your health as well as its magical culinary enhancing skills you can guarantee that you will in fact, make (not lose) friends with garlic! Bon appetite! Click here to join TVA and receive the print Lifelines, which offers more nutritional info, recipes and cookbook reviews. Find more nutritional information at veg.ca/nutrition. You do make friends with salad, if you top it with this recipe’s delish dressing! Directions: In a small bowl add ingredients. Whisk. Set aside until needed. Directions: Preheat oven to 400F. In a large bowl add potatoes, sweet potatoes, leeks and oil. Mix thoroughly. Put potato mixture into a roasting dish or pan. Place in oven and bake for 30 minutes until potatoes are fork tender. Remove from oven, place in a large heat safe bowl, sprinkle with dill and black pepper to taste, add dressing as needed and toss. Serve hot or refrigerate and serve cold. Find links to more recipes at veg.ca/recipes. Fans of the fantastic Sadie’s Diner will be thrilled to hear that the sister location, Sadie’s Juice Bar and Ice Creem Parlour has expanded their menu beyond just freshly squeezed juice and ice creem (although these are both still in ample supply as well!) to include $5 sandwiches, a soup of the day and chilli. Walking into Sadie’s on a cold winter day, I was happy to arrive somewhere bright and sunny, with retro decor and happy music. I opted for the Tuna Melt sandhich on incredibly delicious, seed-filled, hearty toast (bagels are also an option). I sat down at one of the two diner tables and enjoyed my fresh and delicious sandwhich, topped with melted Daiya cheese. And can you believe that once I pulled out my Vegetarian Discount Card I got to enjoy this sandwich for only $4.50?! Other offerings on the menu included a cheezy melt sandwich, smoked tempeh, or the soup of the day – butternut squash. If you can tolerate something cold to chow down on in the midst of winter, they’ve also still got dairy-free shakes and floats to go along with the classic diner fare. A vegetarian couple is looking to rent their spacious, furnished 3bd home available from mid-February to mid-May, 2012. The home is recently renovated, semi-detached and at the end of a safe, quiet, family-friendly street. It features hardwood floors, front yard, porch, and backyard, adjacent to a ravine. Minutes to the 506 streetcar, the 22 Bus, and Coxwell Subway Station. Wifi, linens, plates, utensils, etc. included! $1800/month, plus utilities. No pets, no smoking. Click herefor a full listing and photos.If interested, please email eastendsublet@yahoo.ca. Frances Moore Lappe, author of Diet for a Small Planet, which was groundbreaking at its time of publication in 1971, is in town at the end of January to speak on her new book, EcoMind. Tickets are $10 for the event on January 31st at the Wychwood Barns. Click here for more information. Join the Toronto Vegetarian Association today! Founded in 1945, the Toronto Vegetarian Association is a volunteer-driven charitable organization devoted to providing information and support to people who are interested in making healthier, greener, more peaceful food choices. By becoming a member of TVA, you’ll support vital programs such as the largest annual vegetarian food fair in North America, the vegetarian directory, a volunteer-run vegetarian resource centre and the Veggie Challenge. You’ll also receive our quarterly print newsletter Lifelines, and be entitled to a free, customized subscription to VegE-News. Plus, you’ll have the option to purchase our Discount Card, offering savings at over 80 veg-friendly businesses in the GTA. All donations of $20 or more are tax-deductible. Join the Toronto Vegetarian Association today and help us inspire people to choose a healthier, greener, more peaceful lifestyle. Posted April 30, 2012 by TVA. Filed under News from the Toronto Vegetarian Association, Uncategorized.